Play Minotaurs caught between the city and the jungle. 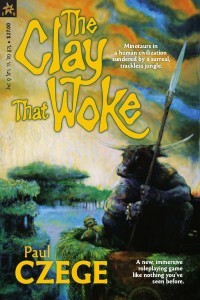 The Clay That Woke caused a bit of a stir in RPG-circles when it came out. It had a successful Kickstarter, and in a time where pdf’s are becoming more and more prevalent, it delivered a fancy book with 90 tokens to be used with its resolution mechanic, the Crater of Lots. All this made me very curious, so of course I wanted to take a look at it. The Clay That Woke is a game about minotaurs living and working as an servant class in a once-great society. The minotaurs adhere to a strict honour code called the Silence, detailing what a minotaur should and should not do. A minotaur who breaks Silence too much will be seized by uncontrollable urges and run out into the jungle until he has regained his composure. And so, the game changes between life in the civilisation of humans, and strange encounters in the jungle. In human society, they live among the humans and are party to the turmoil of human society, while in the jungle, they encounter weird creatures and terrible dangers. Whenever a player minotaur encounters a sufficiently loaded situation, they will draw from the Crater of Lots – krater meaning a large bowl used to mix wine and water in ancient Greek society. First, the GM will load the crater with a number of tokens, representing the challenge faced by the player. Then the player, and other players present in the situation, may add tokens to the crater from their own supply. Finally, the player will draw four tokens from the crater and then consult a menu of options to determine what the draw means. The book is structured rather unusually, in that sections of rules or instructions for the players and GM alternate with sections of fiction that gives an insight into the society and mindset of the game world, as well as the kind of story the game wants you to play. In order to help you find your way around the document, the table of contents is structured more like an index, or maybe a reference guide, telling you where in the document to go look for details on this or that aspect of the rules or the game world. My impression: So. Let’s get this out of the way. The text of this game annoys me mightily. The alteration between fiction and game text is not in itself bad, but that, combined with the vague and oblique way the game text is written, means I never really felt certain what the game wanted me to do. I don’t really know when to draw from the crater, I certainly don’t what the significance of a certain token in the crater is, and I have no really idea of what the players will be doing in the game. There are many aspects of the game that intrigue me. The world seems fascinating, the minotaurs are an interesting concept for player characters – particularly with the duality of servility in the cities and ferocity and strangeness in the jungle – and the Crater of Lots is a novel resolution mechanic that has a lot of potential for providing fuel for the story. As such, there is a part of me that aches to try the game, to see if the gold I can see gleaming in there comes out in play, or will turn out to be nothing much at all. But the game does not help me reach that point. It teases and obfuscates, and seems to assume that I will glean the meaning behind the words. The main motor of the game seems to be the economy of the tokens and drawing from the Crater of Lots. But I’ll be honest – I don’t really have a feel for how the tokens should flow. You regain your life token when the jungle comes for you in the civilised world or when the civilised world comes for you in the jungle – what does that mean? How does it look in play? It seems an important part of the game economy, yet it is explained in not even two lines of text! The same is the case with the instructions for the gamemaster’s prep. Czege tells you to prepare a number of things before play, but only gives oblique instructions on how to do so. You need to create “life and employment circumstances” for the players in your group – but what goes into such circumstances? What is a good starting point for a minotaur? I must also make situations for the Jungle excursions – but what makes a good encounter in the jungle? Czege remarks in a post on the Kickstarter for the game that he wrote the game this way deliberately, in order to entice people, to make them want to play the game. That is a noble sentiment. And I would agree – making people excited about a game is definitely one of the goals when writing a roleplaying game. But Czege also says that it is not important that a roleplaying game book is written as a good procedural text. And this is where I most certainly disagree. Once a text has drawn me in, it needs to take me by the hand and help me make the game come alive. The game needs to help me find the kind of play the creator envisioned – or, failing that, at least one my group will enjoy. Vincent Baker’s Apocalypse World is an example of a game that achieves both: every page oozes the post apocalyptic mood the game wants to portray. But at the same time, it is one of the most accessible texts I’ve ever encountered in roleplaying. It’s not easiest game to run, mind you. Apocalypse World is a challenge to run, but an enjoyable one. I keep finding myself leafing through the tome, picking out advice and finding new aspects to bring into the game. And that is where The Clay That Woke seems to fail: its challenge is not in running the game, but in accessing it, and finding out how to get it to the table in the first place. And no matter how enticing it is, there is a limit of how much you can frustrate someone before they give up and go play something easier instead. How would I use this: I could probably cobble something together and run this game if I poured the time and energy into it, sifting through the book and filtering out the elements needed to make the game work. But for the moment at least, I’ve been turned off by the writing style and deliberate obliqueness of the text. As such, I’m unlikely to run the game any time soon. I’d be perfectly happy to participate in someone else’s game, because I’m still curious to see if this works, though.